All transactions are safe and secure with a reliable history in online purchasing behind each of our associates. Buy the Monty Python and the Holy Grail Knights Who Say Ni! t-shirt to own Monty Python clothing and merchandise. This humorous Ni T is a fan favorite. 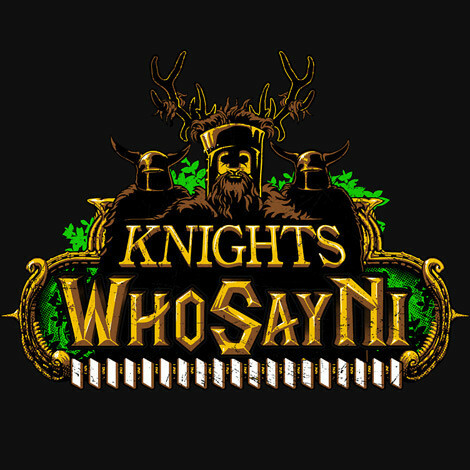 The World of Warcraft themed design on the front features a silhouette image of a knight from the movie Monty Python and the Holy Grail ready to repeat his favorite quote. You'll soon be repeating the Monty Python movie quote, "We want a shrubbery!" In the movie, King Arthur and his men encounter the Knights Who Say Ni on their way to meet the Enchanter. The knights warn Arthur that they will say "Ni" again if he does not appease them. The fronts of these Monty Python t-shirts reveal that they were telling the truth, "Ni!" In addition to the Monty Python and the Holy Grail Knights Who Say Ni! tee above, browse the Monty Python Clothing Gallery for more apparel like men's and women's clothes, kids shirts or hoodies.